ATLANTA (AP) — Talk about a mismatch. The New Orleans Saints have been unstoppable. The Atlanta Falcons have struggled to stop anyone. It all adds up to a Thanksgiving night game that could get out of hand quickly. “Where do you start?” moaned Marquand Manuel, the Falcon’s defensive coordinator. The Saints (9-1) are leading the NFL in scoring and really piled it on the last two weeks, dropping 51 points on Cincinnati and 48 on defending Super Bowl champion Philadelphia in a pair of blowout wins. Most amazingly, New Orleans has scored on 24 of its last 29 possessions, not counting kneel-downs at the end of the game. Eighteen of those possessions have resulted in touchdowns. Next up is Atlanta (4-6), a team that has lost two straight and ranks near the bottom of the league in every major defensive category. The Falcons have been ravaged by injuries, losing both safeties for the season and top linebacker Deion Jones for the last nine games. Jones has returned to the active roster but it’s not known if he’ll be able to go Thursday. While Drew Brees is having another huge year at age 39, New Orleans’ running game might be the real key to its offensive success. 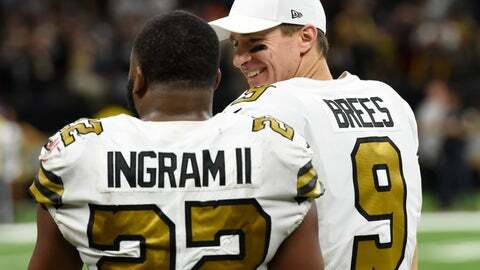 The Saints rank sixth in the league with an average of 131.4 yards per game, and they’ve been especially tough to defend since Mark Ingram returned after serving a four-game suspension for violating the NFL’s policy on banned substances. Ingram has rushed for 388 yards since his return, combining with Alvin Kamara to provide a dynamic 1-2 punch. Kamara has run for 617 yards and 11 TDs, to go along with 56 receptions and four scores. Marquand said Atlanta’s focus will be on trying to turn the Saints one-dimensional. Indeed, Brees is still the one who makes it all click. Last week, with newly signed receiver Brandon Marshall on the inactive list and the Eagles shading their coverage toward top receiver Michael Thomas, Brees threw touchdown passes to second-year pro Austin Carr and rookie Tre’Quan Smith. Smith finished with 10 catches for a career-high 157 yards, giving the Falcons another player to worry about, though he hasn’t been practicing during the short week because of a foot issue. Thomas is certainly a handful, having already eclipsed 1,000 yards receiving with six games still to go. When these longtime division rivals met in Week 3, New Orleans pulled out a 43-37 victory in overtime . Most memorably, Brees forced the extra period with a 7-yard touchdown run in the closing minutes of regulation, spinning away from both Brian Poole and Robert Alford to reach the end zone. The Saints then won the coin toss and held the ball for more than 7 minutes in OT, capped by Brees’ 1-yard TD plunge that ended the game. The thrilling contest set a course for both teams. The Falcons lost their next two games, as well, and never really recovered. The Saints haven’t lost since.